Our End-of-Row retrieval trailers have earned a reputation as dependable workhorses in any retrievable/reusable drip tape system. 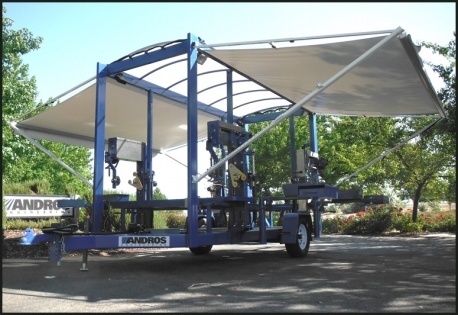 The new LRV (Large Reel Version) trailer is the next logical step for End-of-Row Retrieval Systems from Andros. Designed for those large tape users that must cover a lot of acres. It will retrieve any type or size of tape. To reduce costs and increase field capacity. 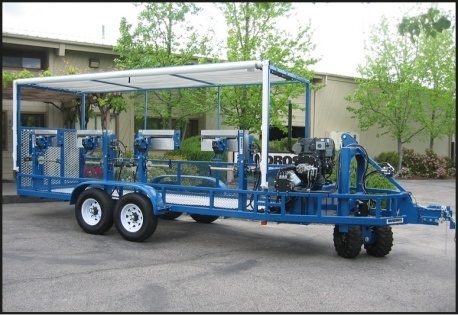 The LRV system is built around the new Agri-Spool II, 24-inch reel. This reel holds more than twice the amount of tape as the standard 18-inch Agri-Spool. The LRV Trailer incorporates design changes that accommodate these large reels. New "open arbor" retrieval heads eliminate having to lift and carry full reels of tape. Full reels drop onto a rubber matted loading tray that allows the spool to go from retrieval head to storage on standard pallets without ever being lifted. Newer models are now equipped with a super-duty traverse carriage which virtually eliminates levelwind maintenance and includes a self lubing traverse box with smooth passage tensioning head capable of passing the AEC rigid 700 Series Couplers. Optional: The rear-mounted forklift allow operators to palletize up to 12 reels per pallet without lifting new reels of tape. Optional: The overhead racking system provides ample storage space for empty reels. Optional: The Tape Linear Counter keeps track of amount of tape on reel. This allows the operator to put on the exact amount of tape they will need for the next installation. Optional: The Splicing Stations allow each head to become a tape splicing station. Any manufacturers heat splicer will mount on our specially designed work-tables. Continue retrieval operations and splice at the same time. All electrical wiring and control components necessary to operate the heat splicing machine are mounted on the trailer.